This book, by the author of Moneyball, is essentially a biography of the two men who did more to change the way we think about thinking. 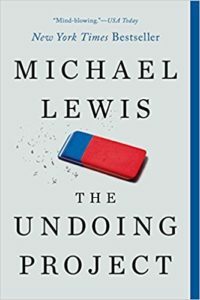 Amos Tversky and Daniel Kahneman are Israeli psychologists who discovered heuristics and connected the fields psychology and economics, helping create the new field of behavioral economics. If you recognize either name, it is probably Daniel Kahneman who wrote the outstanding book Thinking, Fast and Slow a few years ago. At the beginning of that book he writes about his friend and partner and collaborator and how the book would not have been possible without him. That man was Amos Tversky who died in 1996 and thus did not share the Nobel Prize with Kahneman as recipients of the award must be alive. If you enjoyed Thinking, Fast and Slow, you should absolutely check this out. It details the lives of both men and how they developed their theories, how the worked together, and how they split up. It is a fascinating story of two men who have affected my life directly. As a former instructor for the Army, I taught heuristics to my students as part of the assigned curriculum which is of interest to probably only me. If I’m totally honest, I started reading this book thinking it was Michael Lewis’ newest book, The Fifth Risk. It is not but it was incredibly relevant to what I do now and I like Lewis so I kept reading. It opens with a story about the General Manager of the Houston Rockets, an NBA franchise that currently uses some of the more advanced analytics in the sport. I was interested in that as I am studying to become a data scientist and the connection of the field to sports is what drew me to it. When I found out it was about Kahneman I was excited as I LOVE Thinking, Fast and Slow. I wanted to know more about his collaborator but never looked him up, I just knew he existed. As someone who loves the history of how things came to be, this book was straight up my alley. If you like any of these things, well, the NBA is not really relevant to the book as whole so not that part. If you like Thinking, Fast and Slow, biographies of scientists, heuristics, or Michael Lewis then give this one a shot. I still plan on reading The Fifth Risk but is an Audible exclusive, some come on 2-for-1 sale! Share the post "Maybe we don’t think so good"